Of course a standard of this type would be of value to shipowners in deciding on bottom paint for their ships. Bunker prices have spiraled. The pressure to reduce air emissions from shipping is growing. Even a few percent more or less fuel efficiency can make a huge difference, especially when extrapolated across the world fleet. But such a standard needs to be comprehensive. Ideally it would take into consideration the entire life cycle of a ship and compensate for increased hull roughness from paint degradation and spot repairs. The International Standards Organization has expressed a willingness to help develop such a standard. In the meantime, there is a great need for shipowners, ship officers and crew to gain control of the fuel efficiency of their own ship (or fleet) and adopt measures that will enable them to achieve maximum hull efficiency and performance and maintain it. What is needed is a simple method which puts the owner, Captain, Chief Officer, Chief Engineer in charge of their own ship’s hull efficiency and provides a pathway for inevitably and invariably achieving the most efficient hull coating system and hull and propeller husbandry regimen for the entire life of their ship. 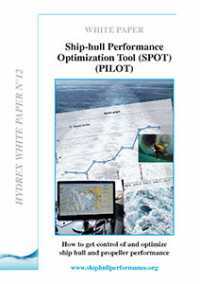 Hydrex White Paper 12 “Ship-hull Performance Optimization Tool (SPOT)” is just such a method, presented with all applicable detail so that any officer of any ship anywhere can simply take the White Paper and its accompanying “Quickstart Guide” (Hydrex White Paper 12A) and begin applying the information using existing resources and immediately start seeing results in terms of improved hull efficiency. Over time, this will lead to the optimization of the hull coating system and hull and propeller maintenance program for a ship or fleet. With enough information gathered, this system would lead to the optimization of the hull efficiency of the entire world fleet with consequent enormous reduction in fuel consumption and resulting air emissions from shipping worldwide. SPOT is being piloted and refined and any and all feedback from use of this system is encouraged so that a final version can be published. Hydrex White Paper No. 12 is available now for download at www.shiphullperformance.org or can be requested from any Hydrex office. We are hoping to receive a flow of feedback from implementation of SPOT.